This post was inspired by one of my sisters who caught the ‘Green’ bug. She purchased 5 beautiful plants (yeeaah!) but without consulting her greatest resource – me (Nooooo!). Needless to say, she bought the right plants for the wrong place. The right plants because all the plants she bought were easy for beginners. Wrong place because most of the plants she bought needed more light than her house could provide. 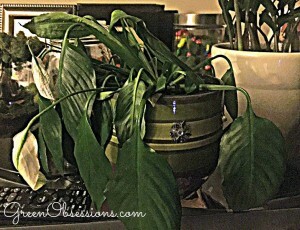 In light of this I decided to write a post to hopefully encourage her not to give up on indoor gardening (2 plants did not make it) and to inspire her to continue with the right type of plants. This is also for any beginners out there who may need a little tried and tested advice on plants that can survive in low light conditions. I wish I had searched this information before diving into buying my first few plants because just like my sister I made those same mistakes. 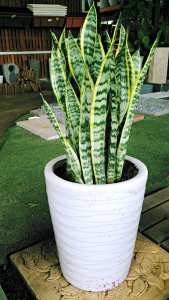 Also known as mother-in-law’s tongue, this is one of the very first plants I purchased and my number one top choice for a house with a low light situation. This plant is tough and can tolerate poor conditions including drought and low light. It is also good at resisting pests making it a great choice for beginners. Needless to say this plant is hard to kill. It is likely due to die from over watering than neglect. I kept one in the guest bathroom with no windows for about a month with no harm done. I have since moved it to my living room, in a corner that receives minimal light. Water moderately between spring and autumn and very sparingly in winter. It tolerates dry air and any normal room temperature should be fine. It can survive at up to a minimum of 10oC. This plant can be propagated by dividing the plant or from leaf cuttings. This is my second favorite low light plant. 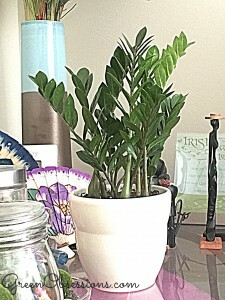 ZZ, short for Zamioculcas zamiifolia is a slow-growing plant that forms underground bulbs. It tolerates a broad spectrum of light conditions from full sun to shade, making it perfect for rooms with few windows. I placed this plant in a bathroom with no windows and artificial light for 1 month and it survived. It now sits in our living room as i found it a bit too big for the bathroom. The ZZ plant tolerates a minimum of 15oC. Water regularly during the growing season and let soil dry out slightly before watering again. Water sparingly in winter. Over watering will manifest as yellowing and dropping of leaves. This plant can be propagated by division as well as leaf cuttings. I did not quite think much of this plant at first when I saw it. I found the leaves to be quite boring as the only intriguing thing to me about this plant was the spadix and the shield-like white leaf around it called a spathe it produced. I resisted buying this plant for quite some time although I knew it would do well in my rather low light apartment. After a long stand-off, I succumbed and decided to give it a try. A few days after getting this plant, I went away for 2 weeks and upon my return, the plant looked like it was on the verge of death with leaves drooped to the sides of the pot. 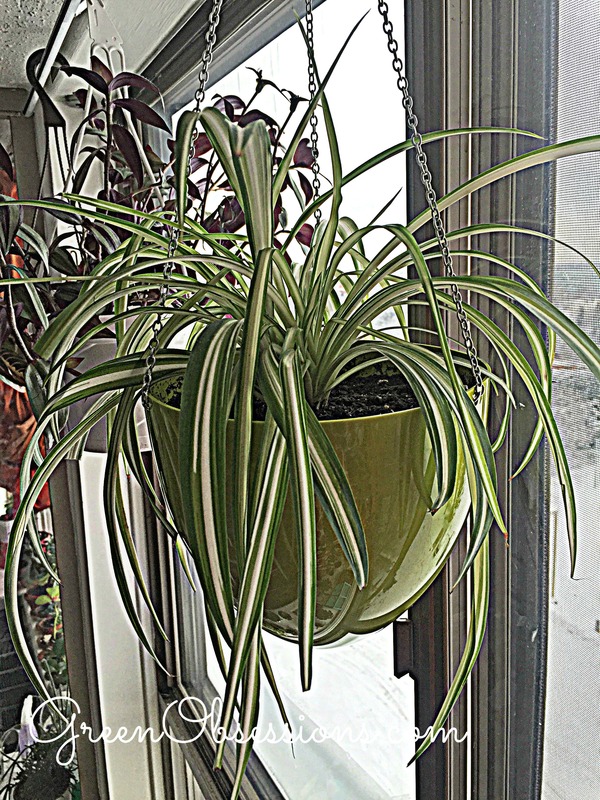 I quickly gave it some water and by the next morning I was greeted with an upright plant as if nothing had happened. It had forgiven me and there and then I fell in love with it. The Peace lily is a flowering perennial with dark green leaves. It tolerates low light to filtered light but avoid direct sunlight. Prefers warm temperatures and can tolerate temperatures down to 15oC. Water generously between spring and fall and less during winter. As mentioned earlier it will let you know when it needs watering by drooping its leaves, although do not wait until it looks like mine in the picture on the left below before watering. 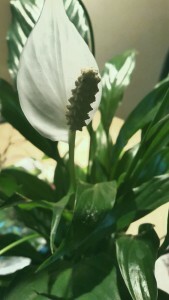 The peace lily can be propagated by division. This plant looks beautiful in a hanging pot with its pups cascading down. These pups can be easily rooted and potted to produce new plants. The variegated type of this plant is the most common. Some sources state this plant is not picky about humidity whereas others stress misting to provide high humidity. It likes warm temperatures but prefers cool temperatures in winter ( a minimum of 5oC). Water regularly spring to autumn and sparingly in winter. It prefers bright filtered sunlight but i find it tolerates low light as in a north facing window where I place mine. 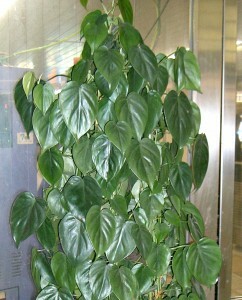 I believe no low-light plant collector will be seen without a heart-leaf philodendron in their collection. These plants are tough and grow fast. They are usually seen in hanging baskets or provided a stake in their po to which they can climb on. I prefer them when they are let to trail freely over bookcases and shelves. It makes any room come alive. I recently acquired to 2 stem cuttings from an acquaintance who was glad and generous enough to share. She had a few of them in pots and one was over 40 years! It didn’t look it though as it was quite small. Over the years, she had been taking cuttings and gifting them to others. They tolerate shady to filtered sun locations but keep away from direct sunlight. They like the soil constantly moist and will only tolerate slight drying out. I have read that this plant prefers high humidity and will do well in bathrooms. I have however seen them in other locations and do well with no misting. They can be propagated from stem cuttings and rooted in water to provide a whole new plant. 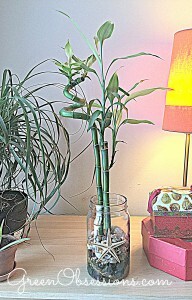 I would be remiss if I did not mention the lucky bamboo, also known as Dracaena braunii. They are not bamboo at all. They are very common and found on most office desktops. Most people, including myself keep them in clear glass containers filled with water and decorated with bright coloured marbles ors stones. It is advised that you change the water weekly, and although I started doing that when I first got it, it became quite tedious and so I do so less often now. About once every few weeks. 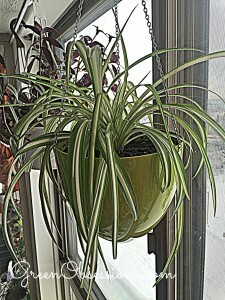 I like this plant because I don’t have to do much with them until I have to change the water and clean the container. Like members of the genus Dracaena, they tolerate low light , but can also be kept in a bright location away from direct sunlight. The proper way to probably grow them is in soil, as in their natural habitat. There are so many other low light plants out there suited for the beginner and I hope to be able to compile most of them some day. If you have any more you would like to share, please comment below. 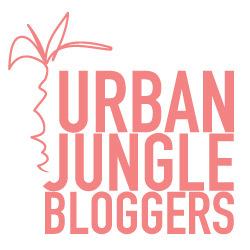 I must say i love your site,it so cool and fresh. Are you sure you didn’t miss your calling as a home and gardens editor?! The pics are really cool and the writing as well. Good job luv. Thank you Christine. I’m glad you enjoy my blog.